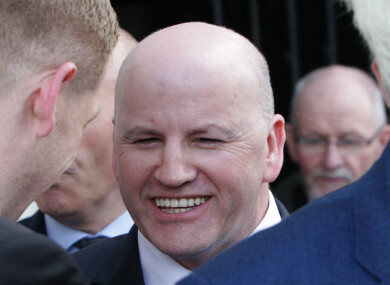 SEAN GALLAGHER WILL appear before Leitrim County Council today as he formally begins his presidential campaign. It’s understood that the businessman has already held discussions with a number of individual councillors in an effort to get them to support his bid. Gallagher will address Leitrim County Council at a meeting today, when he is expected to discuss the areas of disability and the work of the Irish Defence Forces. TheJournal.ie understands that he will publicly commit to visiting members of the Defence Forces on overseas peacekeeping missions with the United Nations as his first trip abroad. He is also expected to outline a new initiative in the area of disability, which will focus on around 900,000 people across the island of Ireland with a disability, as well as their carers and their families. He will confirm a timeline for the commencement of this initiative and the themes involved during his address. Gallagher must win the backing of 20 members of the Dáil and Seanad, or four full local authorities, to get on the ballot for the election on 26 October. Last week, he said that councillors in ten local authorities had submitted motions supporting him. During 2011 election race, he secured the backing of Meath, Leitrim, and Clare county councils and Cork City Council. However, he was one of six candidates to lose out to incumbent Michael D Higgins, winning 28.5% of the vote. Email “Peacekeeping and disabilites on the agenda as Sean Gallagher to formally begin presidential campaign”. Feedback on “Peacekeeping and disabilites on the agenda as Sean Gallagher to formally begin presidential campaign”.